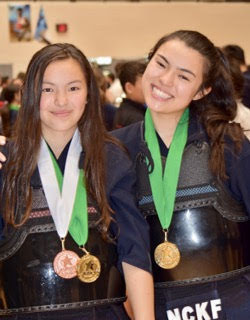 NCKF Summer Camp @ San Jose Buddhist Temple on Fri.
@ Leigh High School on Sat. and Sun. Carolyne and Catherine did great performances at All US Jr. Championships in April 7. Both finished top 8 in the individual division, and Catherine placed third in the team division for the 14 - 18 years old girls bracket. Look at their happy faces in the photo. Congratulations, Carolyne and Catherine!! Can't see the photo? Click here to be redirected to the web album. 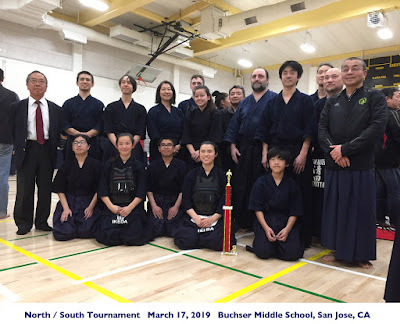 Season 2019 has started with N/S tournament in March 17 at San Jose. Carolyne and the NCKF women's team won against SCKF. Carolyne led the team to win as Sempo. Congratulations! Carolyne was admitted by Stanford University. Congratulations!!! We have more photos. Click here to be redirected to the web album. 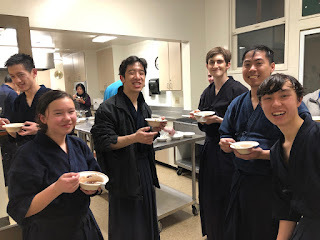 Japanese new year treats were served at the King Center practice in Jan. 8. 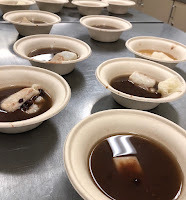 Japanese new year treats, oshiruko (sweet red bean soup with rice cake) and ozoni (savory soup with rice cake), were served after the practice. It is the tradition of Japanese martial arts known as Budo Hajime (first practice of the year). It is the ceremony to pray the members' health and improving their skill. Friends and families of San Mateo dojo were invited. One of our dojo member recovered San Mateo Kendo Dojo logo from the one originally created in 1981.